I had a television content problem. Charter Communications went to a digital only network a few months ago and started requiring set top digital converters to unscramble program content. I’m not bashing Charter in this post for their decision, but when they did this, the two small TVs in my basement became unusable. I have a wall mounted TV in a workout room another one in a game room. Both have a cable coax drop next to them. But I don’t use them enough to warrant paying $20/month for two set top boxes and they don’t have a place to mount a set top box unless I created a stand or somehow mounted them on the back of the TV. In a perfect world, I would not have cable TV service at all. I previously wrote about my obsession with dropping cable TV and cable TV online alternatives. But I also don’t want to create a family revolt. For right now, it simply is what it is. I tried a couple of different HD antennas for local programming and because I could mount the antenna behind the TV. I’m about 35 miles away from many of the major network broadcast antennas. The antennas provided limited success. The problem is that both of my TVs are in a basement and not near a window. Even with a power booster, the reception was spotty at best. My next thought was to buy a Chromecast HDMI stick to put in the TVs and then simulcast from a tablet near the TV. That would work for some content and provide an alternative to cable. As fate would have it though, when my wife was shopping at a local retailer they didn’t carry Chromecast. They had a Roku streaming stick and after some preliminary research we decided to give it a try. The Roku streaming model was a closer fit for what I wanted. 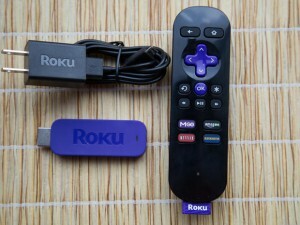 In the Roku system the device streams content directly to the connected screen and not as a simulcast. Since my display device is a wall mounted TV, I didn’t want to have to bring a tablet with me to view the content. The installation of the Roku was simple. Plug the stick into a HDMI slot and the AC adapter to wall for power. Then change the source on the TV to HDMI and follow the onscreen setup. The process asks questions about language and wifi connectivity. Once configured an installation key is displayed on the screen with a URL and you simply go to a website to register the device. After installation, the Roku menu presents applications much like a phone or tablet. There is a base set of applications or you can add more through the on screen Roku menu or via a computer hooked to your account. Roku solved my television content problem. It streams Netflix. It streams news channels with clips of recent news. It streams ESPN with live sports. It streams live music through Pandora. Let’s just say it has options. There are over 1000 app channels. 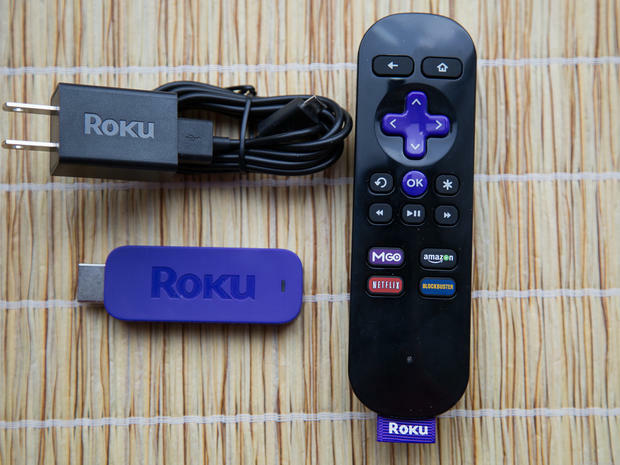 Some of the channels do require separate subscriptions (like Netflix), but the Roku service is a one-time fee for the price of the stick. There is no recurring fee for the roku service. This is the type of solution I was looking for on those basement TVs that don’t get used everyday. Oh and it still fits within my dreams to dump cable TV service. One day I’ll get there!